Following an impressive stint at the Gold Coast Commonwealth Games 2018, Indian wrestlers are all set to go for gold at the upcoming Jakarta Asian Games 2018. Interestingly, this is the same place where India had their best performance ever in wrestling at the 1962 Jakarta Asian Games, and the grapplers would like nothing better than a chance to improve on that record at that very place in 2018. Bajrang Punia : Can he raise the Tricolor once again on Day 1 of Asiad wrestling? The very first day of wrestling, i.e. 19 August shall see the elite Indian wrestlers in action. From emerging superstar Bajrang Punia to the legendary champion Sushil Kumar, five freestyle wrestlers from India will compete for the top honours. Starting the day would be freestyle wrestler Sandeep Tomar, who has had the experience of Rio Olympics 2016. Playing after a long time on a major international mat, Sandeep will aim to make himself count in time for Tokyo Olympics 2020. He will be followed by popular wrestler and a diligent disciple of wrestler Yogeshwar Dutt, Bajrang Punia. The Under-23 World Championship silver medallist, Bajrang will be aiming to capitalize on his Commonwealth Games success with an Asian Games gold. Given that he had previously won a silver medal on debut at Incheon Asiad 2014, Bajrang will leave no stone unturned to change the colour of the 61kg category silver medal into a shining 65 kg category gold. Bajrang will be followed by legendary wrestler Sushil Kumar Solanki. Returning to the Asian circuit for the first time since the Doha Asiad 2006, where he had won a bronze, Sushil Kumar would like nothing better than a strong podium finish, especially a gold medal. Given that the competition in this circuit is apparently less, Sushil should have a close to a cakewalk en route to winning gold. Sushil will be followed by Pawan Kumar, who shall compete for India in the Men's 86 kg freestyle category. He will be followed by seasoned veteran Mausam Khatri, who will aim to change the colour of his bronze medal from Guangzhou 2010 edition. Day 2 of Asiad wrestling shall see Indian women in action, apart from the lightweight wrestlers from the Greco-Roman category, who will be trying their luck in this edition of the Games. Starting the Indian challenge for the day is Vinesh Phogat, the legendary wrestler. 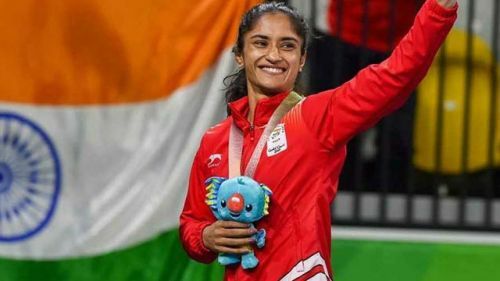 Having won a second consecutive Commonwealth Games gold medal, she would give it her all to change the colour of her bronze medal from the previous edition held at Incheon in 2014. She would be followed by Pinki, who shall compete in the Women's 53 kg freestyle category. She will be followed by Pooja Dhanda, the Youth Olympics silver medallist from the 2010 edition and the recent silver medallist from Commonwealth Games 2018 in the 57 kg. category. This being her debut Asian Games, she would like nothing better than a strong podium finish from this tournament. Following her would be star wrestler Sakshi Malik, who is competing in the women's 62 kg. freestyle category. The Rio Olympics bronze medallist, who had a lacklustre start to her campaign this year with an unimpressive bronze medal from the Gold Coast Commonwealth Games, shall aim to get back on track in time. She will be followed by super heavyweight wrestler Sumit Malik, the Commonwealth Games gold medallist, who will be looking forward to making a mark in the 125 kg category event. Kiran Bishnoi: Can she spring up a surprise on Day 3 of Asiad 2018? The third day of wrestling at the Asian Games shall bring the final two wrestlers of the women's freestyle category -- the present CWG bronze medallists, Divya Kakran [69 kg] and Kiran Bishnoi [76 kg] into prominence. Though not much is expected, the two will give it all to spring up a surprise, for even a bronze from Asian Games' wrestling counts, given the intense competition wrestling witnesses in these tournaments. They will be followed by Gyanender and Manish, the wrestlers from the Greco Roman category, who will compete for India in their respective categories, 60 kg and 67 kg respectively. The last day is solely devoted to the Greco Roman wrestlers, including emerging wrestler Hardeep Singh, who has had the experience of Rio Olympics. He would love to clinch an Asiad medal on debut, as he joins the squad of Gurpreet Singh, Harpreet Singh and Naveen, who will be giving it their all as they compete on the final day of wrestling at Jakarta Asian Games. Men's Greco Roman:- Gyanender [60 kg. ], Manish [67 kg. ], Gurpreet Singh [77 kg. ], Harpreet Singh [87 kg. ], Hardeep Singh [98 kg. ], Naveen [130 kg. ].